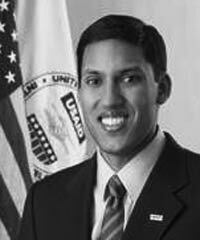 As the 16th Administrator of USAID, Rajiv Shah leads the efforts of more than 8,000 professionals in 80 missions worldwide. Since taking this role in December 2009, Shah managed the U.S. government's response to the devastating 2010 earthquake in Port-au-Prince, Haiti; co-chaired the State Department's first review of American diplomacy and development operations; and now spearheads President Barack Obama's landmark Feed the Future food-security initiative. He is also leading “USAID Forward,” an extensive set of reforms to USAID's business model focusing on procurement, science and technology, and monitoring and evaluation. Previously, Shah served as Undersecretary for research, education, and economics, and as Chief Scientist at the U.S. Department of Agriculture, where launched the National Institute of Food and Agriculture, which significantly elevated the status and funding of agricultural research.